During the years of America's ascendancy, the great ships brought waves of immigrants to the promised land. In sight of the Statute of Liberty, the huddled masses disembarked in search of the American dream. In the imagined future, the great ships play a different role. 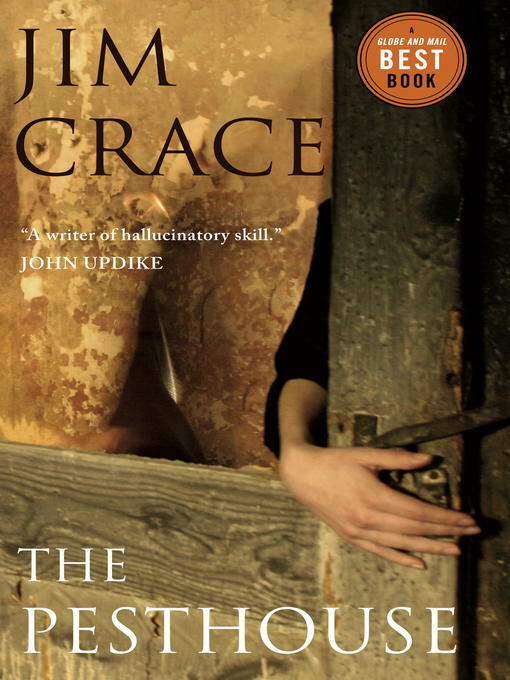 In a work of outstanding originality, Jim Crace's The Pesthouse envisions a future America in ruins and a reversal of history: desperate Americans seeking passage to the promised land of Europe. Crace's future United States is a lawless wasteland. The economy collapses, industry ceases, and the remaining populace returns to subsistence farming. The only hope rests with reaching the east coast and obtaining passage by ship to Europe. Like many Americans, Franklin Lopez and his brother, Jackson, leave their farm to begin the long trek east. Within sight of their goal, Franklin is forced, by an enflamed knee, to stop. While Jackson continues forward, Franklin seeks rest in a seemingly abandoned stone building in a forest. Inside, Jackson discovers Margaret. Margaret is feverish with a deadly illness and is confined to the Pesthouse with little hope of recovery. Franklin should flee. Instead, he is drawn to Margaret and stays by her side while she sweats out the fever. After her recovery, Margaret joins Franklin on the journey east. This journey is fraught with danger. Rule-of-law no longer exists and the land is plagued by roaming bandits and slave traders. The threat of danger slowly draws Margaret and Franklin closer to each other. A bond of love begins to form. They also draw comfort from joining a group of like-minded pilgrims. The illusion of safety is soon shattered. While resting from a day of travel, the group is taken captive by mounted bandits. Franklin is taken as a slave. On account of her recent illness, Margaret is spared along with an elderly couple and a baby. Margaret must continue on without Franklin. A bewildered Margaret slowly pushes eastward with the elderly couple and the baby. She is eventually separated from them and must take sole responsibility for the baby. With hope fading, Margaret stumbles upon the refuge of the Ark; a religious community which provides food and shelter in exchange for denouncing all metal technologies. Margaret accepts the laws of the Ark and is allowed to enter with her baby. While safe, Margaret secretly hopes to be reunited with Franklin. Their paths cross again under tragic circumstances. The Ark is attacked by the same mounted bandits that enslaved Franklin. While the Ark is looted and the community massacred, Margaret and her baby escape. They are reunited with Franklin by chance following a slave uprising in the vicinity of the Ark. Narrowly escaping their pursuers, Franklin, Margaret and the baby continue the journey to the East coast. Upon finally reaching their destination, the dream is shattered. Margaret discovers there is no room for women with young children on the ships bound to Europe. There is no choice but to turn back. With the end of one dream a new one is born. Inspired by their growing love, Franklin and Margaret decide to return west, with the baby, as a family. Jim Crace concludes "going westward, they would go free."